NORWALK, Conn.--(BUSINESS WIRE)--While more healthcare providers continue to adopt Electronic Health Records (EHRs), a recent Xerox (NYSE: XRX) survey revealed the need for doctors to educate consumers about digital medical records to comply with upcoming federal mandates. “Healthcare providers turn to us for Meaningful Use assessments and our expertise in developing the new workflows and programs that they will need to attract, teach and support patients’ use of online portals,” Fred said. Despite continued resistance and slow progress, Americans do see some benefits of EHRs, with 62 percent agreeing that they will reduce overall healthcare costs and 73 percent believing that EHRs will improve the quality of service they receive from their healthcare provider, respectively up 2 percent and 3 percent from last year. Xerox supports more than 1,700 hospitals and provides business process outsourcing services to a range of industries, including healthcare, pharmaceuticals, government, technology, communications, banking and financial services, travel, retail and education. This survey was conducted online within the United States by Harris Interactive on behalf of Xerox from Aug. 9 to Aug. 13, 2013, among 2,009 adults ages 18 and older. The 2012 survey was conducted from May 11 to May 15, 2012, among 2,147 adults ages 18 and above. The 2011 survey was conducted From May 5 to May 9, 2011, among 2,720 adults aged 18 and older. The 2010 survey was conducted Feb. 17 to Feb. 19, 2010, among 2,180 adults aged 18 and older. This online survey is not based on a probability sample and therefore no estimate of theoretical sampling error can be calculated. For complete survey methodology, including weighting variables, please see below for media contacts. Since the invention of Xerography 75 years ago, the people of Xerox (NYSE: XRX) have helped businesses simplify the way work gets done. Today, we are the global leader in business process and document management, helping organizations of any size be more efficient so they can focus on their real business. Headquartered in Norwalk, Conn., more than 140,000 Xerox employees serve clients in 160 countries, providing business services, printing equipment and software for commercial and government organizations. Learn more at www.xerox.com. 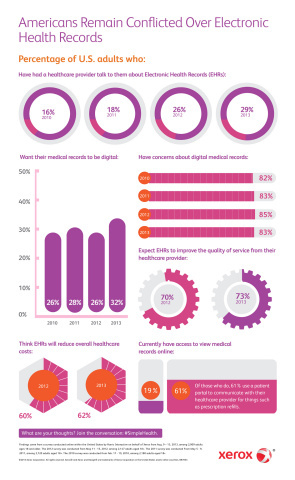 Xerox’s fourth annual EHR survey of 2,009 U.S. adults revealed that only 29 percent of those who have a doctor have been informed their medical records will be converted to digital format.